The namespace of DFS makes it possible to provide shared, which are on different servers under the same name. 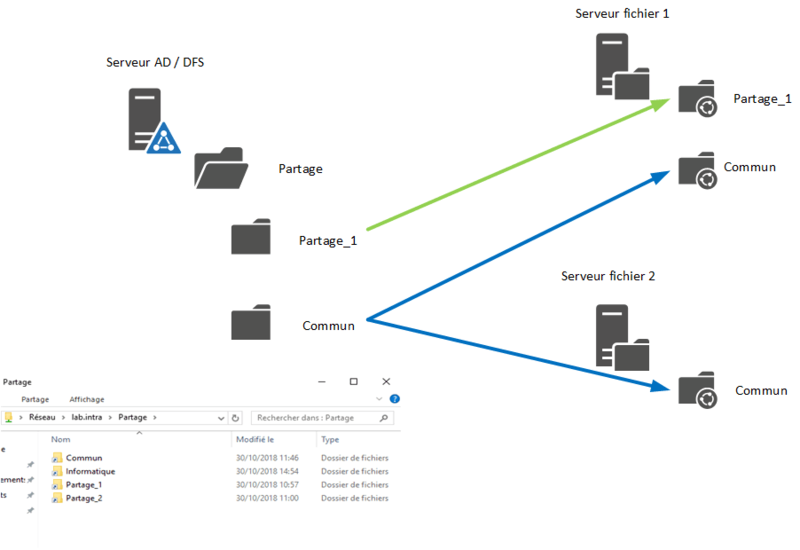 Instead of accessing a shared folder with the \\server-file\ computer address, we will use an address of the type \\domain-name\ share\ computer. The user will be redirected transparently on the “server-file” server. In a simplified way, in the folder \\domain-name\share will be shortcuts to other shares that are several servers and this in a completely transparent way for the user. Using DFS also makes it easy to add resource and server migration because you only need to edit the folder in the namespace. 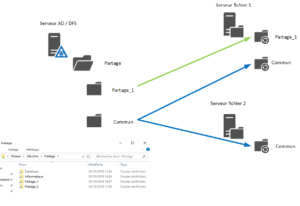 Another interesting point with DFS is the high availability of files, it is possible to replicate the content of a share between several servers and present it under the namespace. Through this tutorial, we will see how to configure a namespace, add a shared folder and use replication.